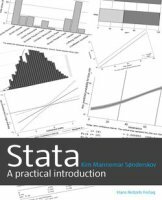 Stata is one of the best and most user-friendly general statistics packages and is increasingly used in areas such as the social and health sciences. This guide introduces the reader to the program and explains how to use Stata efficiently for scientific analysis of quantitative data. A series of examples and exercises with real data guides the reader through data management, basic uni- and bivariate analyses as well as multivariate linear and binary regression. The book also deals with more advanced topics, such as illustrating results from interaction models. The book is written for students who have no previous experience with statistical software, and is therefore suitable for methods courses at Bachelor level. It is also suitable for experienced users of other packages and for Stata users seeking an overview of the program’s basic functionality. Kim Mannemar Sønderskov is an Associate Professor in the Department of Political Science and Government, Aarhus University.